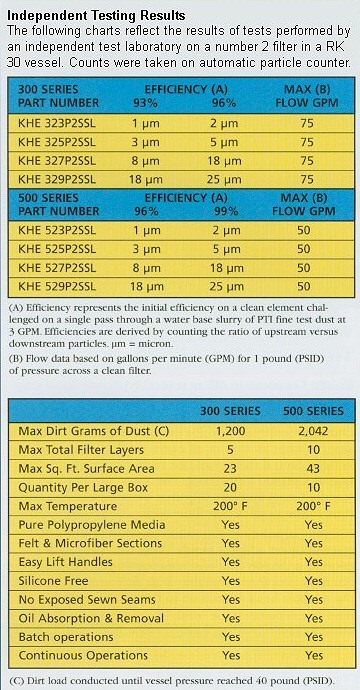 of independent testing, Knight Corporation has designed a unique configuration of variable micron rated special media and micro fiber that uses the entire filter, resulting in very fine particle retention and maximum dirt load.The KHE series offers low initial pressure drop, high dirt holding capacity and exact particle retention. Since fewer filters are required, inventory and disposal costs are reduced. All filters come standard with lift handles for simple and fast removal. 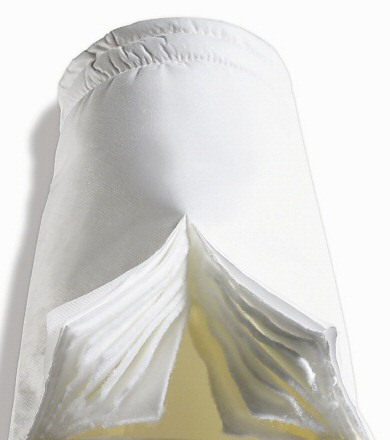 Dirt is contained inside the filter bag which promotes easy disposal, less risk of fluid contamination during change out and minimal operator exposure. Both KHE series have a cover to prevent any fiber migration and have no exposed seams. They are silicone-free and made from 100% polypropylene media which is ideal for oil absorption and easy disposal by incineration. The 300 series is available in ten different sizes and four style tops to fit most bag filter vessels. The 500 series has up to ten layers of media, including six layers of pre-filter media that are individually sealed and inserted into the filter for structural strength and maximum use.